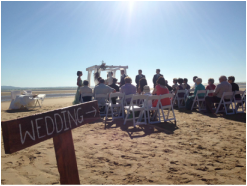 ,1770 # 1 Civil Celebrant - 1770 Agnes Water Celebrant's Penelope Millar, has assisted many happy couples and their extended wedding parties and families to celebrate their love, and ceremony planning with her dedicated professionalism.
" I am very proud of the feeling I have when I see the love of my clients being truly recognised and appreciated, by their separate sets of family and friends." " Penne you are a true gem, and we can't thank you enough for the magic you created for us on our day. Our family keep reminding us of the special love you created to include them into our ceremony, and for this we feel humbly grateful. In fact we don't think that our day would have been quite as special if you hadn't been guiding us from the start.
" You made our wedding special Penelope, and we thank you from the bottom of our hearts for going above and beyond. With all the inclusions you made it perfect, and we continue to be congratulated by family and friends on a stunning ceremony. We at thrilled that you made our day so special, thank you." ​"Our family are still so grateful to you Penne for your insight and care during the recent loss of our darling mum. Nobody knew where to begin, and nobody knew what could be done to honour our beautiful mum and all that she was to us. So many people came and told us that they had never been to a more beautiful service, and we believe it was your suggestion to have the service as a celebration respectfully that created the fitting farewell to our Shirl's. Forever we will be thankful to you for your genuine care and obvious interest in people." " The Bex Family - Gold Coast 2017"
“We wanted to email you and thank you so so much for helping make our day so special - we really had a fantastic time and the ceremony was so beautiful, our wedding just wouldn't have been such a success without you.